OK, I've got to brag a little bit...right? This weekend Imperial Eclipse Stout pours in Boulder, CO at the Boulder Strong Ale Festival and in Boston, MA at the Extreme Beer Festival's Night of the Barrels. 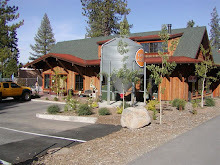 Pretty cool stuff for a tiny little brewery in Truckee wouldn't you say? I'm sure we'll 'hold our own' against much bigger names in the business. The bottle numbering fairy needs to drop by the brewhouse and then the bottles can go on sale. Where in the heck do I get my hands on this beer?!?!?!??!?! I had it at the stout festival at Toronado in San Francisco earlier this year, and it was the best thing I had bar none. So droolworthy it makes me want to pass out, and I still dream of it. Send some to the Bay Area pleeeaaassseeee!